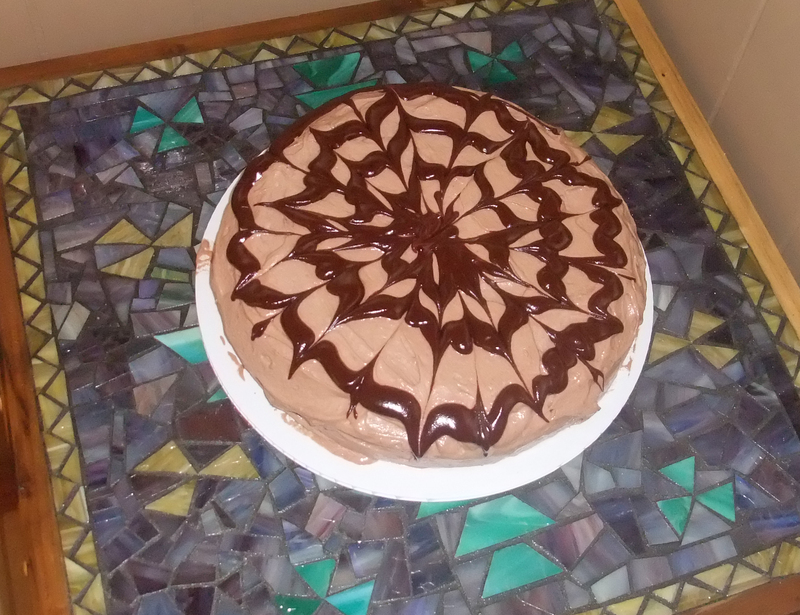 I did this cake for the So Delicious 2013 Recipe Contest earlier this year. The idea was placed out there to come up with ideas using one or more of their products. Let’s just say, the research and development department had been well primed for this project. I LOVE their ice creams, and make a point to highlight them whenever someone starts to go down that “man, you can’t eat ice cream” road. Having a mild-to-moderate obsession with chocolate and peanut butter combinations, this zig zag had been something of a staple in the house for several years now. Coming back to the recipe contest, it was a given that I was going to do something with the ice creams, just a function of what it would be. Melting the ice cream and turning it into a cake worked out great a way to enjoy the ice cream in a new form. Get ice cream out of the freezer and set aside in a bowl allowing to melt. Mix flax and water in small bowl and set aside. Mix flour, cocoa powder, baking powder and salt in a medium mixing bowl. In a large mixing bowl, beat together the buttery spread, sugar, flax mixture and vanilla. Add in the melted ice cream. Pour into a greased 9-inch cake pan. Bake for 30 to 40 minutes, or until a toothpick inserted into the center of the cake comes out clean. Cool completely before adding frosting and ganache. Mix together the flour and cocoa, and set aside. Mix the buttery spread, sugar, oil and peanut butter with an electric mixer on medium for one minute. Blend in the creamer, followed by the flour mixture. Combine ingredients and heat in small saucepan until melted. Drizzle over cake. Enjoy, and keep living the daydream!